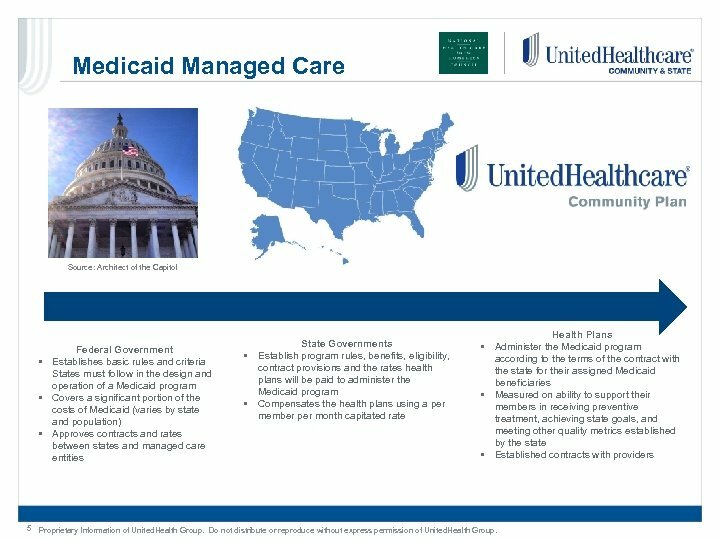 Medicaid Managed Care Source: Architect of the Capitol Federal Government • Establishes basic rules and criteria States must follow in the design and operation of a Medicaid program • Covers a significant portion of the costs of Medicaid (varies by state and population) • Approves contracts and rates between states and managed care entities State Governments • Establish program rules, benefits, eligibility, contract provisions and the rates health plans will be paid to administer the Medicaid program • Compensates the health plans using a per member per month capitated rate Health Plans • Administer the Medicaid program according to the terms of the contract with the state for their assigned Medicaid beneficiaries • Measured on ability to support their members in receiving preventive treatment, achieving state goals, and meeting other quality metrics established by the state • Established contracts with providers 5 Proprietary Information of United. Health Group. Do not distribute or reproduce without express permission of United. Health Group. 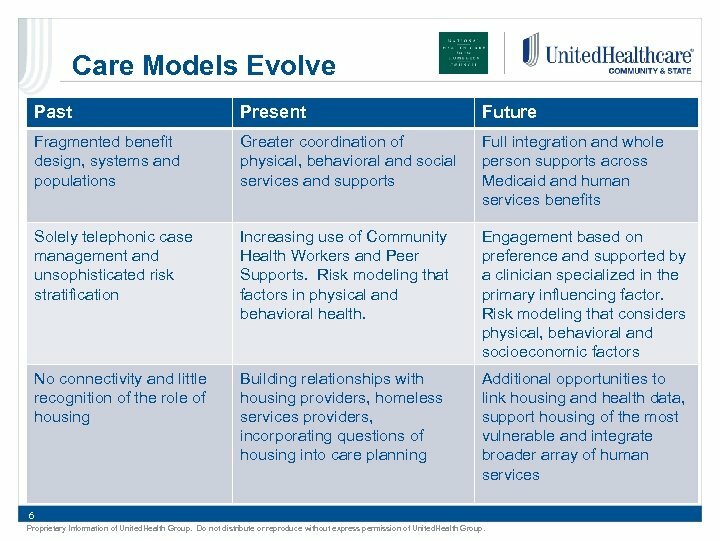 Care Models Evolve Past Present Future Fragmented benefit design, systems and populations Greater coordination of physical, behavioral and social services and supports Full integration and whole person supports across Medicaid and human services benefits Solely telephonic case management and unsophisticated risk stratification Increasing use of Community Health Workers and Peer Supports. 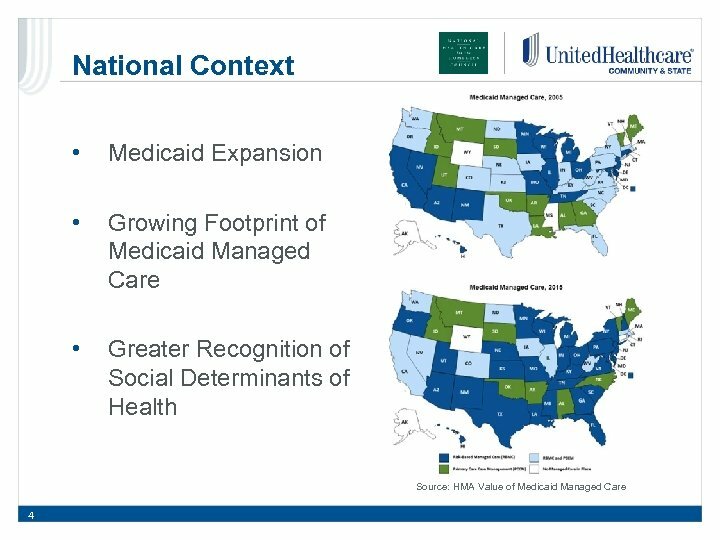 Risk modeling that factors in physical and behavioral health. 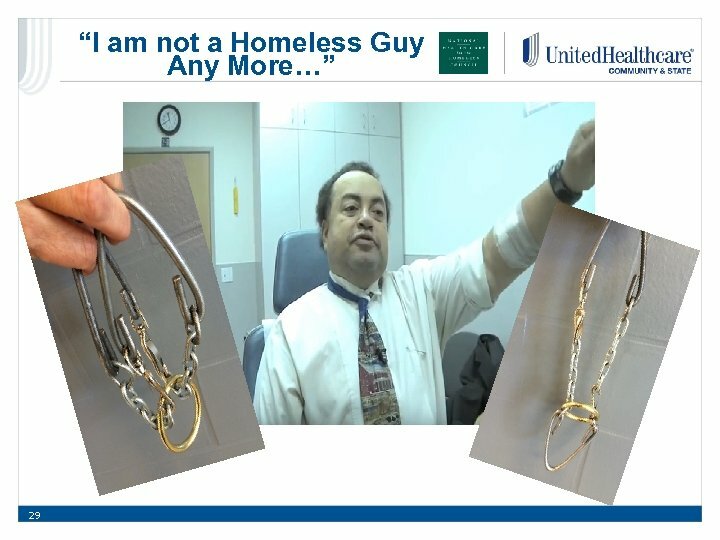 Engagement based on preference and supported by a clinician specialized in the primary influencing factor. 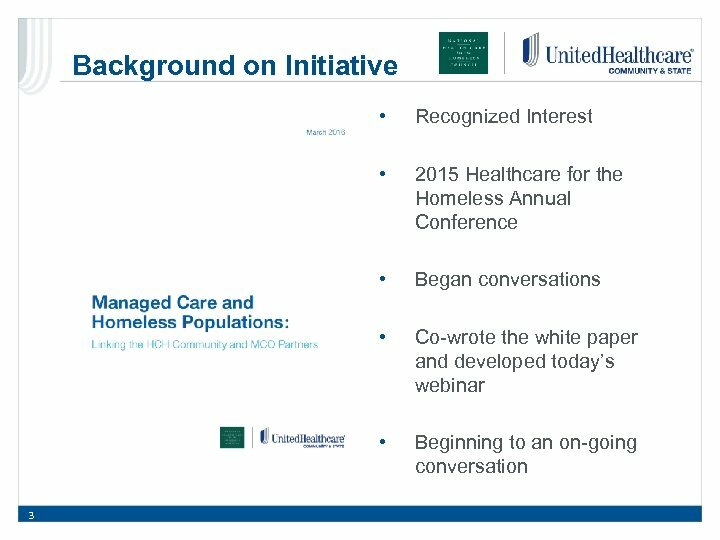 Risk modeling that considers physical, behavioral and socioeconomic factors No connectivity and little recognition of the role of housing Building relationships with housing providers, homeless services providers, incorporating questions of housing into care planning Additional opportunities to link housing and health data, support housing of the most vulnerable and integrate broader array of human services 6 Proprietary Information of United. Health Group. Do not distribute or reproduce without express permission of United. Health Group. 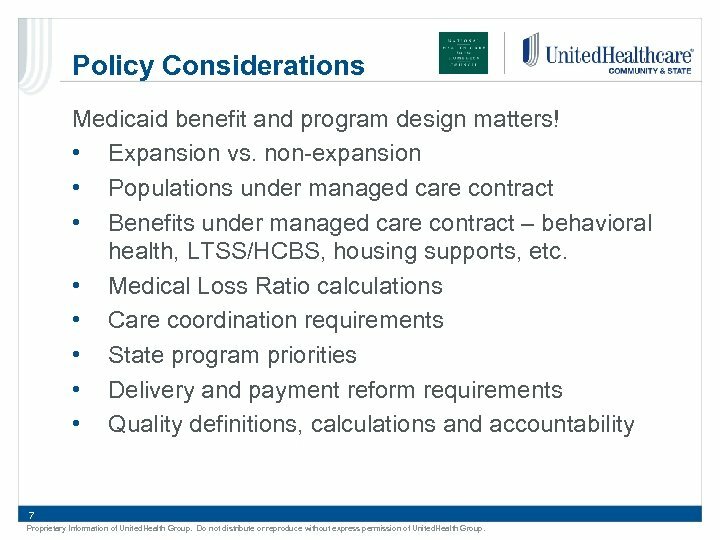 Policy Considerations Medicaid benefit and program design matters! 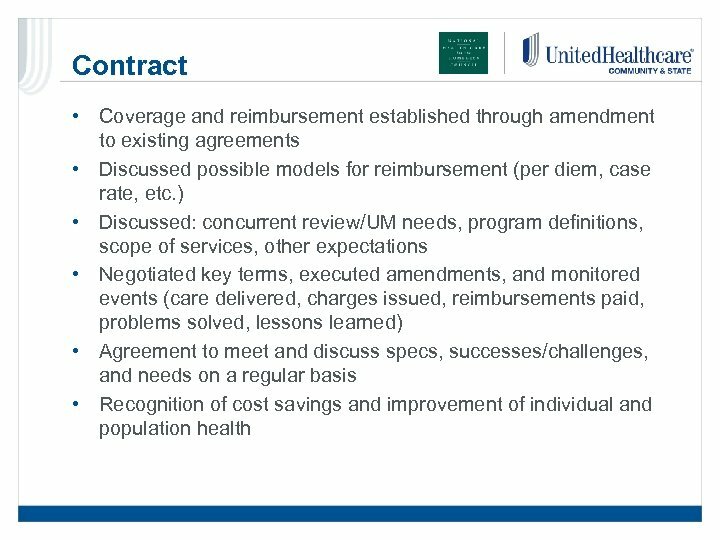 • Expansion vs. non-expansion • Populations under managed care contract • Benefits under managed care contract – behavioral health, LTSS/HCBS, housing supports, etc. 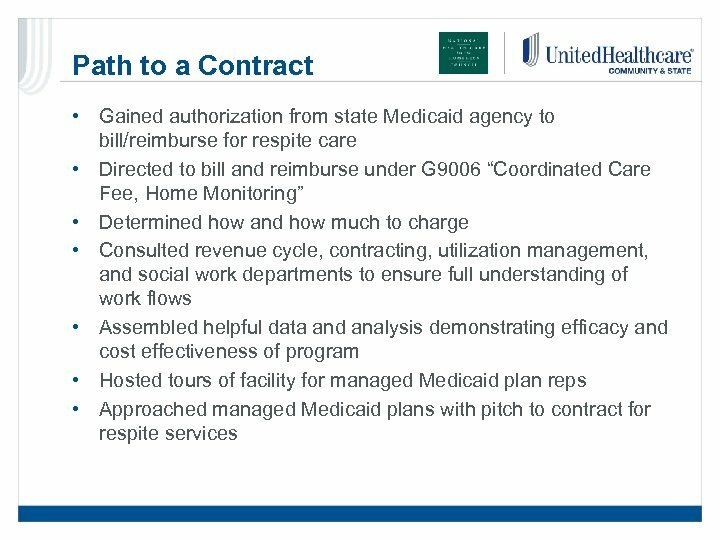 • Medical Loss Ratio calculations • Care coordination requirements • State program priorities • Delivery and payment reform requirements • Quality definitions, calculations and accountability 7 Proprietary Information of United. Health Group. Do not distribute or reproduce without express permission of United. Health Group. 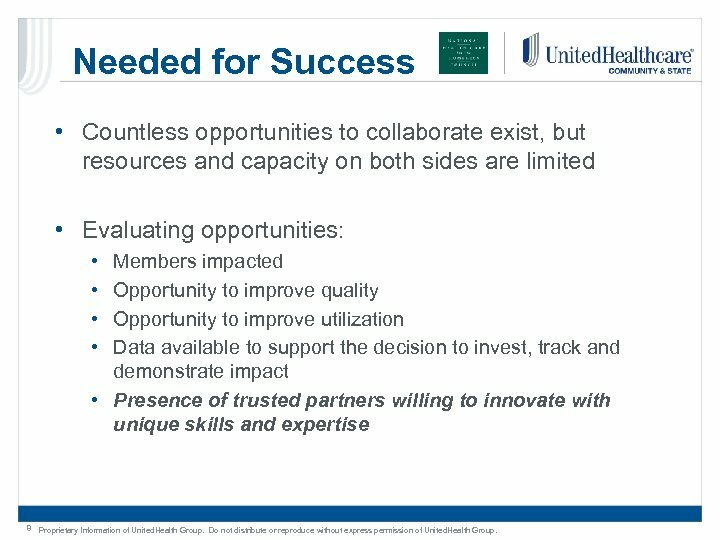 Needed for Success • Countless opportunities to collaborate exist, but resources and capacity on both sides are limited • Evaluating opportunities: • • Members impacted Opportunity to improve quality Opportunity to improve utilization Data available to support the decision to invest, track and demonstrate impact • Presence of trusted partners willing to innovate with unique skills and expertise 8 Proprietary Information of United. Health Group. Do not distribute or reproduce without express permission of United. Health Group. 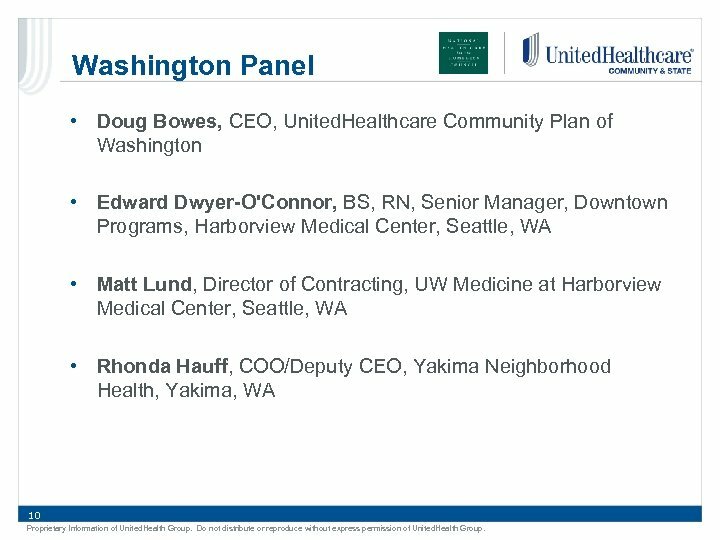 Washington Panel • Doug Bowes, CEO, United. 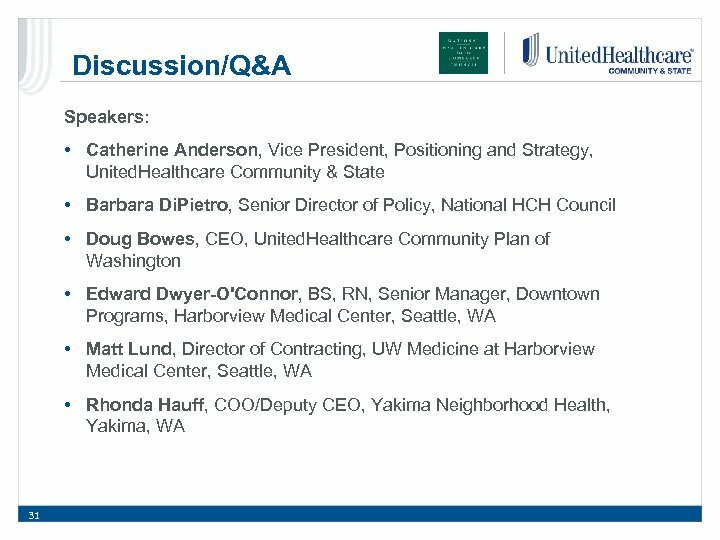 Healthcare Community Plan of Washington • Edward Dwyer-O'Connor, BS, RN, Senior Manager, Downtown Programs, Harborview Medical Center, Seattle, WA • Matt Lund, Director of Contracting, UW Medicine at Harborview Medical Center, Seattle, WA • Rhonda Hauff, COO/Deputy CEO, Yakima Neighborhood Health, Yakima, WA 10 Proprietary Information of United. Health Group. Do not distribute or reproduce without express permission of United. Health Group. 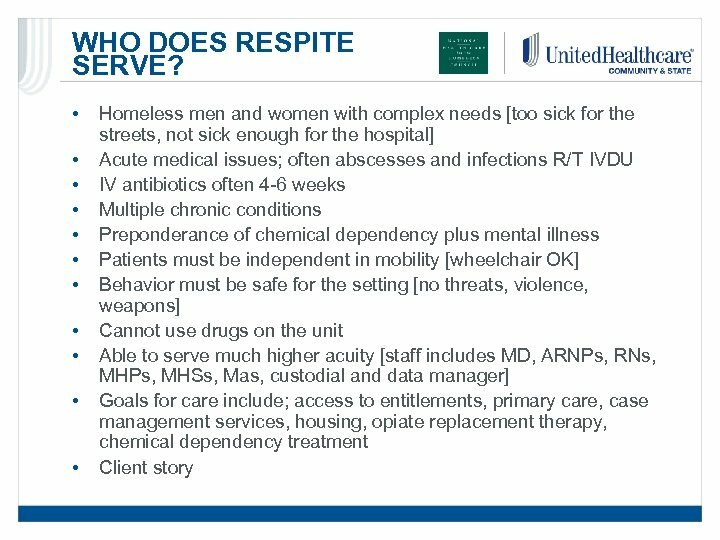 Medical Respite • Medical respite care is acute and post-acute medical care for homeless persons who are too ill or frail to recover from a physical illness or injury on the streets but are not ill enough to be in a hospital. 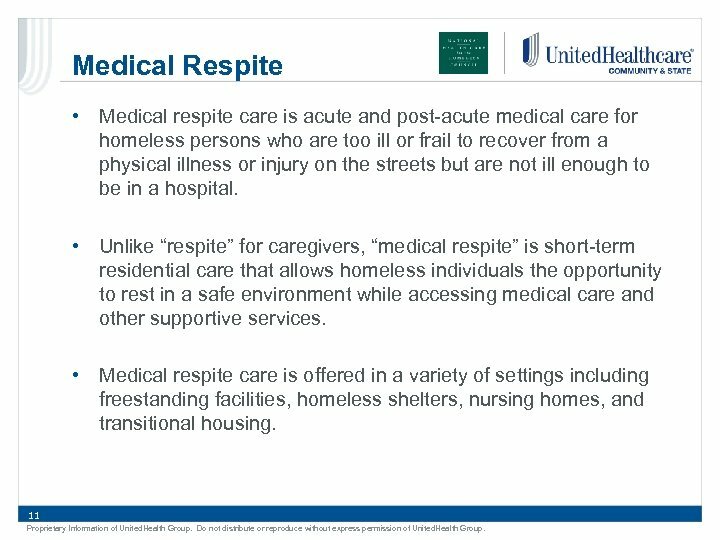 • Unlike “respite” for caregivers, “medical respite” is short-term residential care that allows homeless individuals the opportunity to rest in a safe environment while accessing medical care and other supportive services. 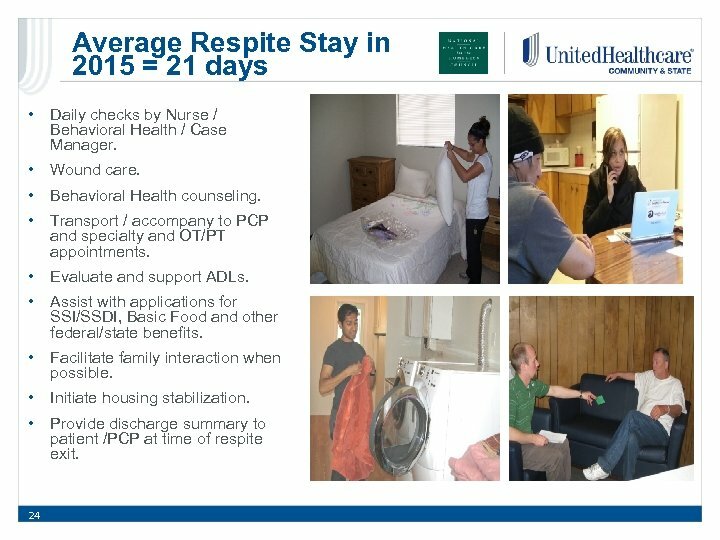 • Medical respite care is offered in a variety of settings including freestanding facilities, homeless shelters, nursing homes, and transitional housing. 11 Proprietary Information of United. Health Group. Do not distribute or reproduce without express permission of United. Health Group. Washington Context • United. 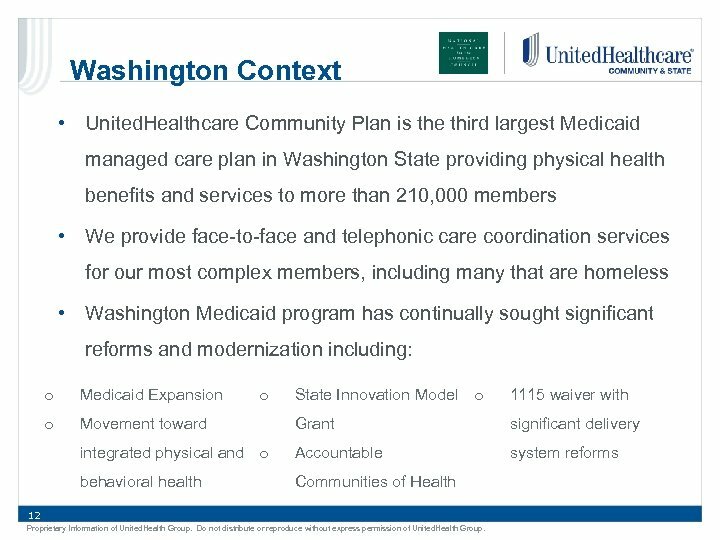 Healthcare Community Plan is the third largest Medicaid managed care plan in Washington State providing physical health benefits and services to more than 210, 000 members • We provide face-to-face and telephonic care coordination services for our most complex members, including many that are homeless • Washington Medicaid program has continually sought significant reforms and modernization including: o Medicaid Expansion o State Innovation Model o 1115 waiver with Movement toward Grant significant delivery integrated physical and o Accountable system reforms behavioral health Communities of Health o 12 Proprietary Information of United. Health Group. Do not distribute or reproduce without express permission of United. Health Group. 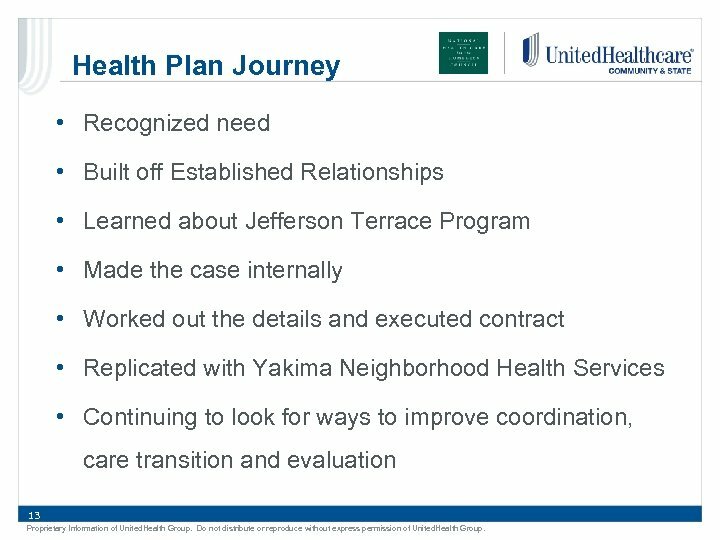 Health Plan Journey • Recognized need • Built off Established Relationships • Learned about Jefferson Terrace Program • Made the case internally • Worked out the details and executed contract • Replicated with Yakima Neighborhood Health Services • Continuing to look for ways to improve coordination, care transition and evaluation 13 Proprietary Information of United. Health Group. Do not distribute or reproduce without express permission of United. Health Group. 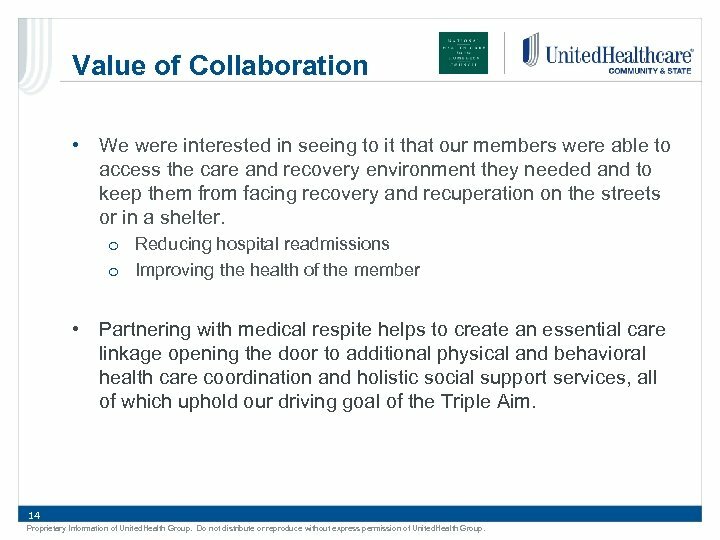 Value of Collaboration • We were interested in seeing to it that our members were able to access the care and recovery environment they needed and to keep them from facing recovery and recuperation on the streets or in a shelter. 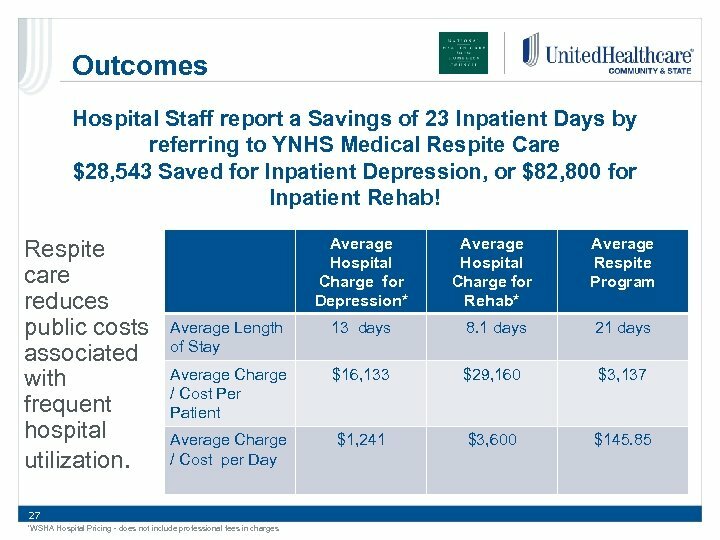 o Reducing hospital readmissions o Improving the health of the member • Partnering with medical respite helps to create an essential care linkage opening the door to additional physical and behavioral health care coordination and holistic social support services, all of which uphold our driving goal of the Triple Aim. 14 Proprietary Information of United. Health Group. Do not distribute or reproduce without express permission of United. Health Group. 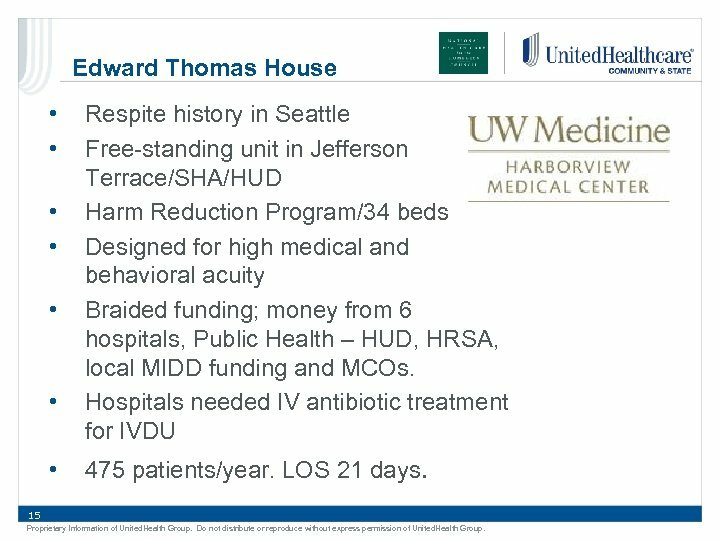 Edward Thomas House • • Respite history in Seattle Free-standing unit in Jefferson Terrace/SHA/HUD Harm Reduction Program/34 beds Designed for high medical and behavioral acuity Braided funding; money from 6 hospitals, Public Health – HUD, HRSA, local MIDD funding and MCOs. 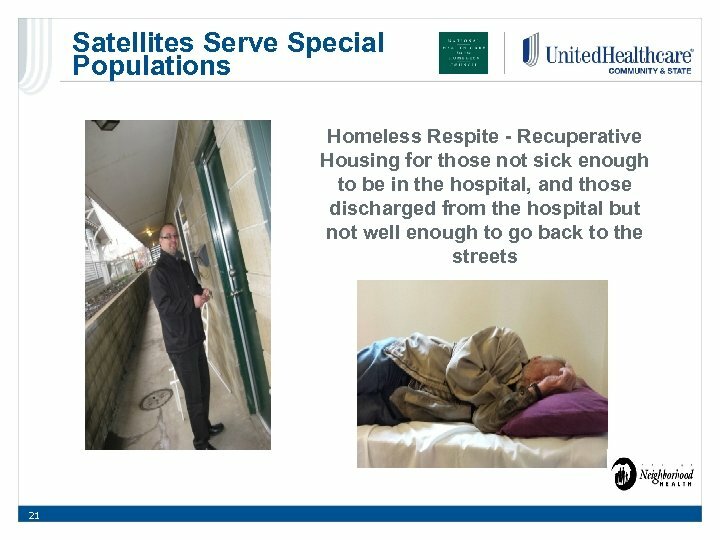 Hospitals needed IV antibiotic treatment for IVDU 475 patients/year. LOS 21 days. 15 Proprietary Information of United. Health Group. Do not distribute or reproduce without express permission of United. Health Group. 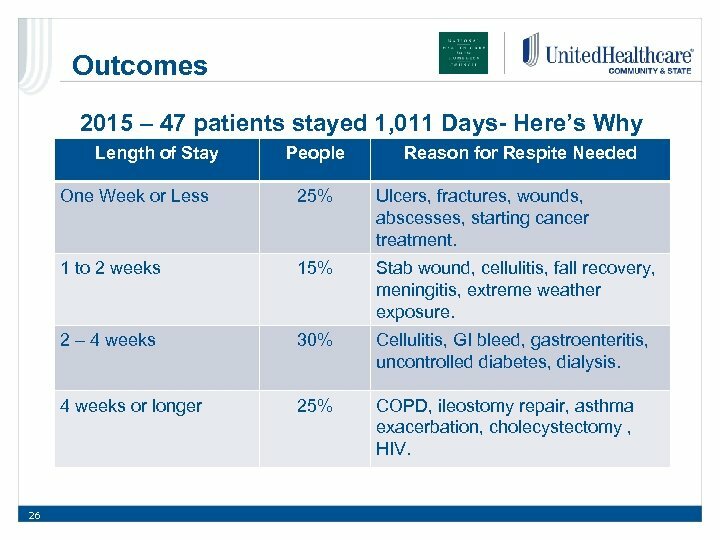 Outcomes 2015 – 47 patients stayed 1, 011 Days- Here’s Why Length of Stay People Reason for Respite Needed One Week or Less Ulcers, fractures, wounds, abscesses, starting cancer treatment. 1 to 2 weeks 15% Stab wound, cellulitis, fall recovery, meningitis, extreme weather exposure. 2 – 4 weeks 30% Cellulitis, GI bleed, gastroenteritis, uncontrolled diabetes, dialysis. 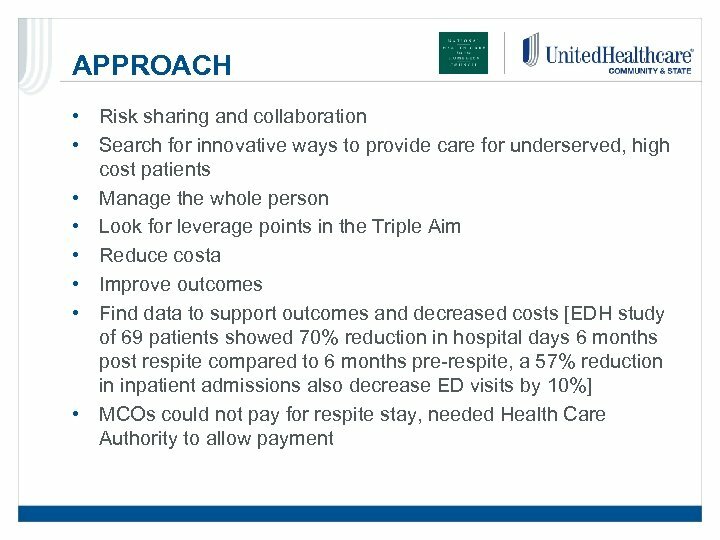 4 weeks or longer 26 25% COPD, ileostomy repair, asthma exacerbation, cholecystectomy , HIV. 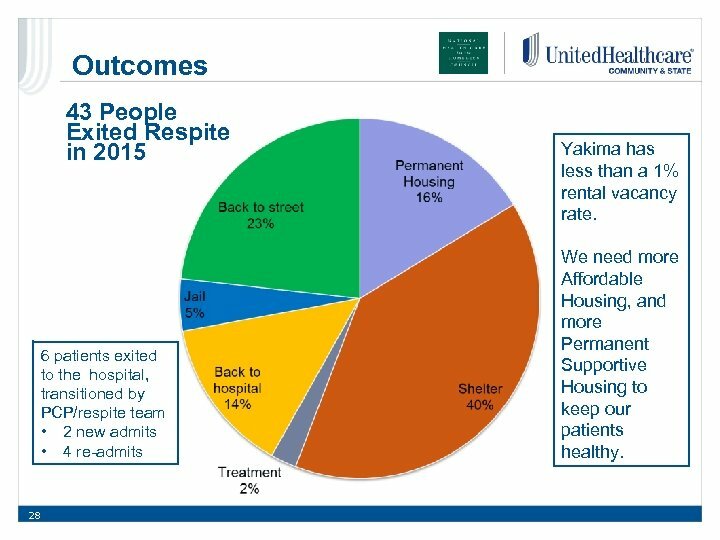 Outcomes 43 People Exited Respite in 2015 6 patients exited to the hospital, transitioned by PCP/respite team • 2 new admits • 4 re-admits 28 Yakima has less than a 1% rental vacancy rate. 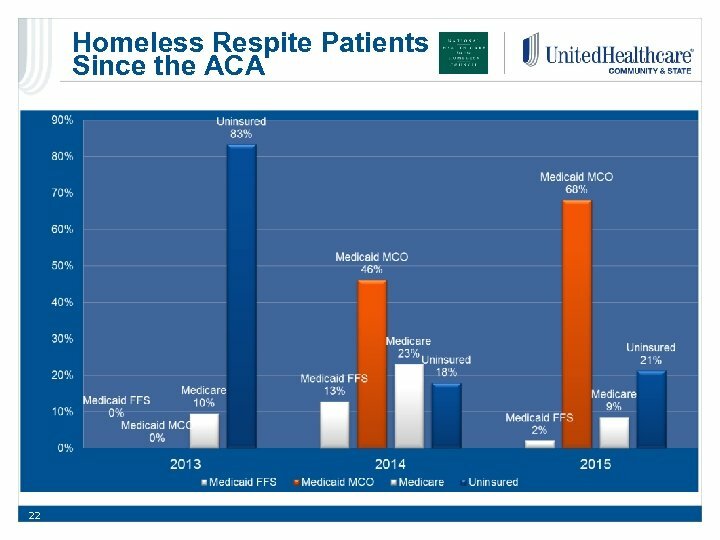 We need more Affordable Housing, and more Permanent Supportive Housing to keep our patients healthy. 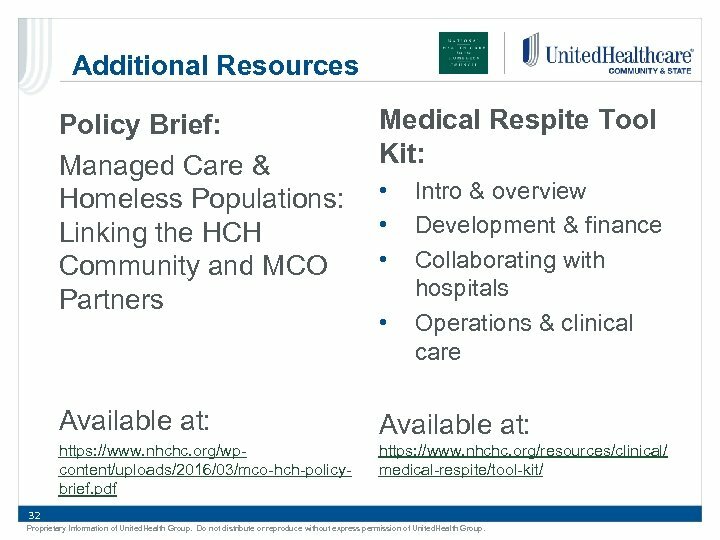 Additional Resources Policy Brief: Managed Care & Homeless Populations: Linking the HCH Community and MCO Partners Medical Respite Tool Kit: Available at: https: //www. 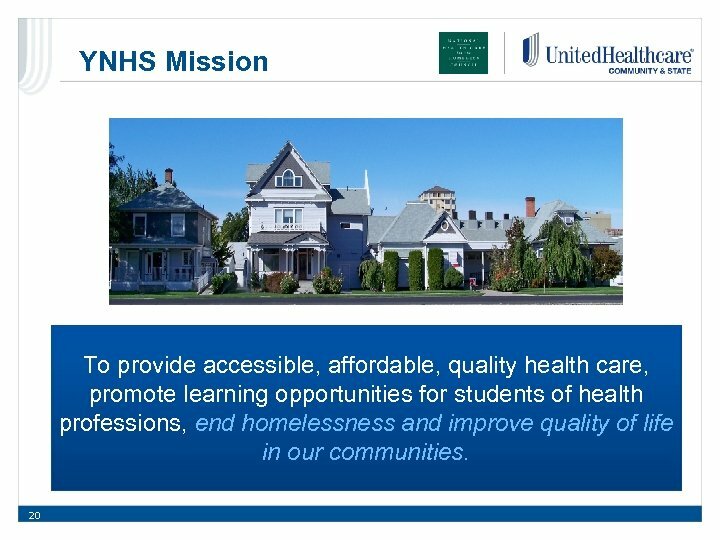 nhchc. 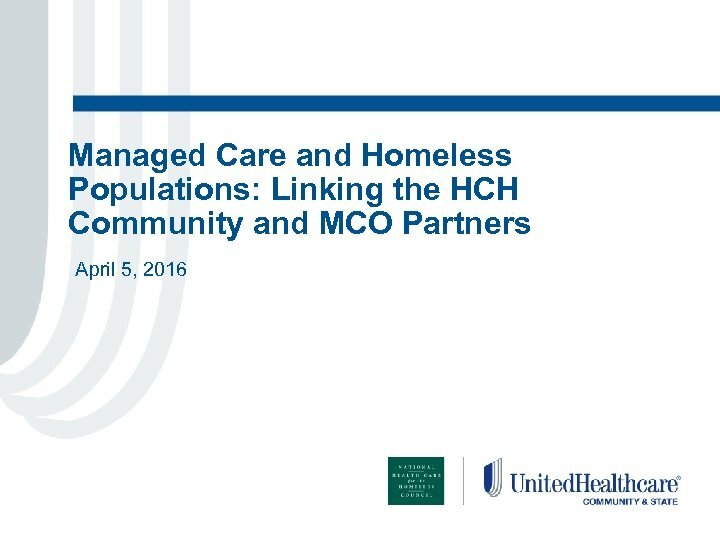 org/wpcontent/uploads/2016/03/mco-hch-policybrief. pdf https: //www. 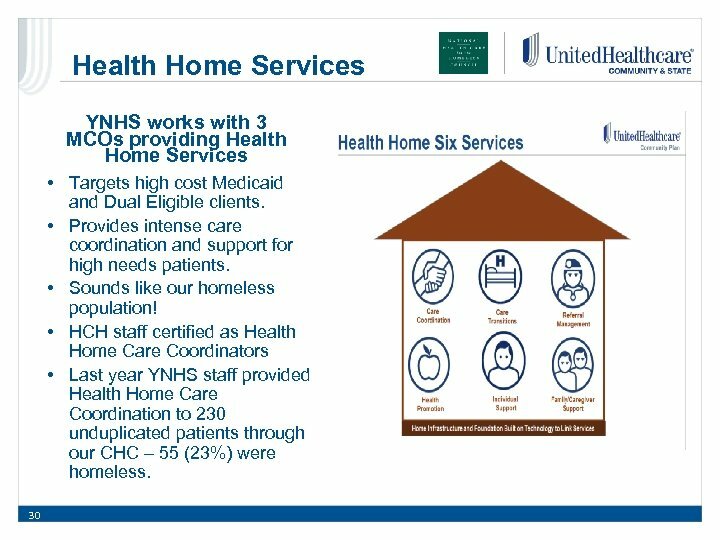 nhchc. 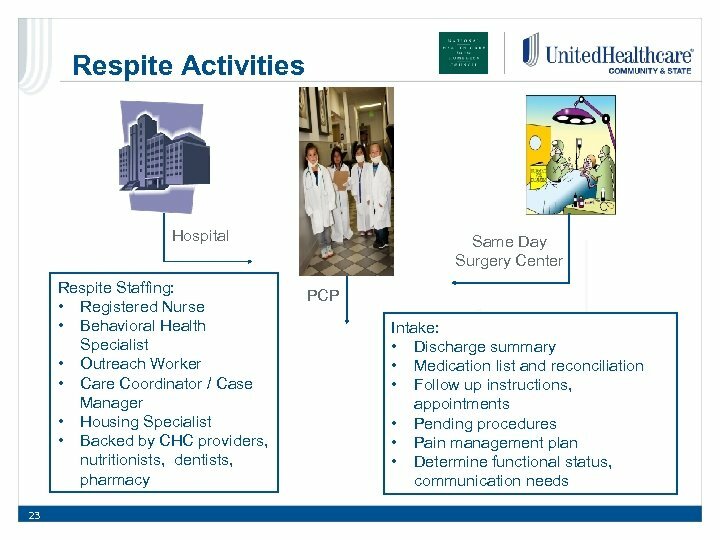 org/resources/clinical/ medical-respite/tool-kit/ • • Intro & overview Development & finance Collaborating with hospitals Operations & clinical care 32 Proprietary Information of United. Health Group. Do not distribute or reproduce without express permission of United. Health Group. 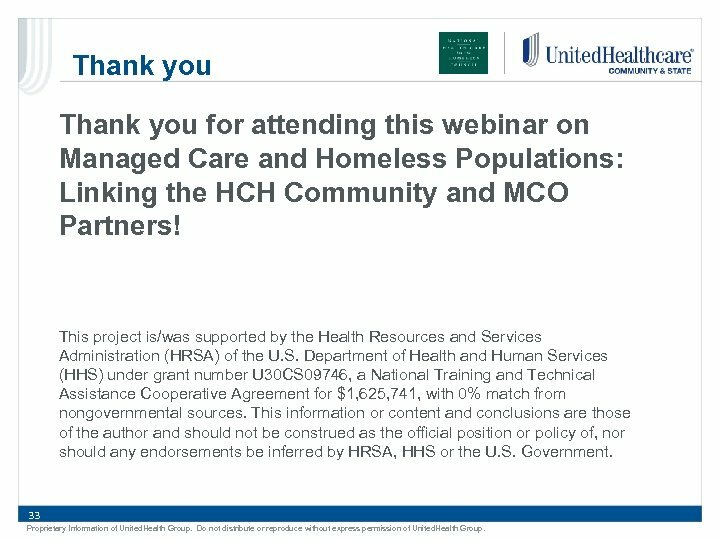 Thank you for attending this webinar on Managed Care and Homeless Populations: Linking the HCH Community and MCO Partners! 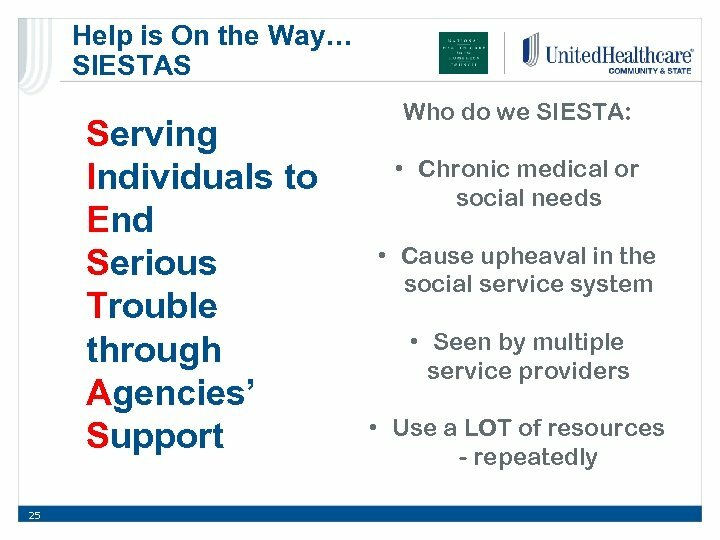 This project is/was supported by the Health Resources and Services Administration (HRSA) of the U. S. Department of Health and Human Services (HHS) under grant number U 30 CS 09746, a National Training and Technical Assistance Cooperative Agreement for $1, 625, 741, with 0% match from nongovernmental sources. 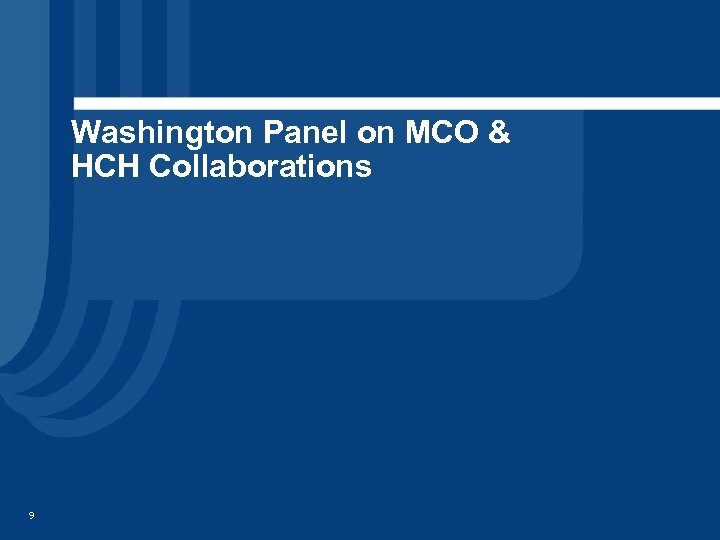 This information or content and conclusions are those of the author and should not be construed as the official position or policy of, nor should any endorsements be inferred by HRSA, HHS or the U. S. Government. 33 Proprietary Information of United. Health Group. Do not distribute or reproduce without express permission of United. 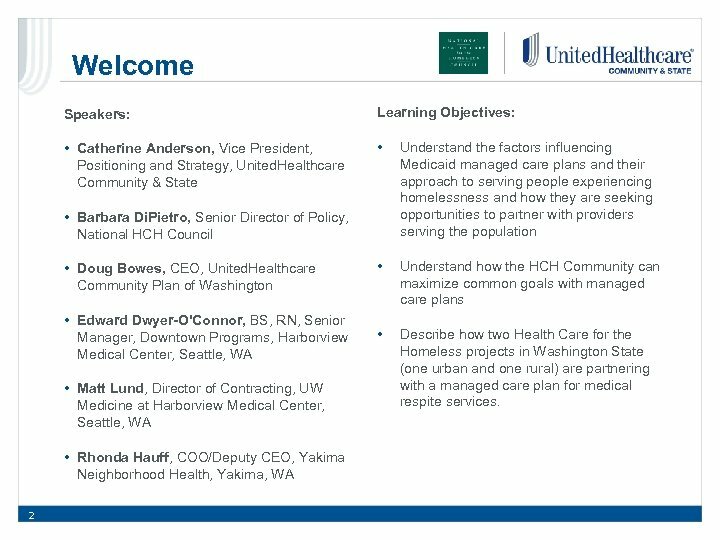 Health Group.